The procedure will be performed when the eye has been numbed with anesthetic drops. A speculum will be positioned to hold your eyelids back just like in LASIK so that you eyelids will not interfear with the actual surgery. The ophthalmologist will then remove the outer cornea cells and proceed with the actual laser treatment. The laser is then positioned to directly treat the cornea. This laser delivery takes about one minute to complete for most patients. Once the laser treatment or refractive ablation is completed, the corneal curvature is reshaped, thus improving the refractive error. Your ophthalmologist will then place a bandage contact lens on the eye for improved comfort along with anti-inflammatory and antibiotic eye drops. 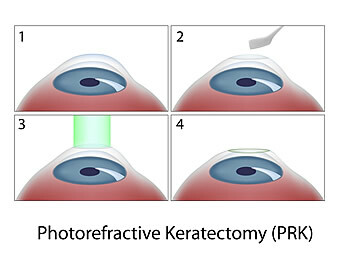 To learn more about PRK, watch the video animation below. The Visian™ ICL offers vision correction that’s sharper, clearer, more vivid, and has greater depth and dimension than other procedures. The main advantage of the Visian ICL over other corrective laser eye surgery is that patients may experience significant improvement in quality of vision after the lens is implanted 1. When compared to the results of corneal refractive surgery, the Visian™ ICL may produce superior vision quality as evidenced by fewer higher order aberrations 2. Patients experience a nearly immediate visual recovery. The Visian™ ICL has been proven to be effective with patients who are in a wide range of refractive errors. In fact, the Visian™ ICL can correct myopia from -3.0 diopters to -16.0 diopters and reduce myopia from -16.0 diopters up to as high as -20.0 diopters with or without astigmatism. Before now, some of these individuals were not candidates for surgical eye correction. Clinical studies have shown how the Visian ICL is truly a breakthrough myopia treatment in terms of vision correction results. Because implantation of the phakic IOL does not require any structural alteration of the eye, results are predictable and very stable.